Andrea Petkovic has lost the german duel against Angelique Kerber in the first round of the US Open 4:6; 7:5; 3:6. After winning the second set she couldn't manage to maintain her good performance in the third. In the doubles she'll compete against Mariya Koryttseva (UKR)/Tatiana Poutchek (BLR) with Tatjana Malek. I managed to postpone organising my official webpage for long. But with the recent success, it was about time to establish something. Coming on the dot for the US Open my page hits the internet. Strike! In the Matchcenter you'll find everything concerning my appearances on the tennis-courts of this world - from an archive of results to my coming dates. In the fan-section we'll have some nice fan-actions, so come back regularly. Also my video-blog is about to be launched, which I am really looking forward to. The first fan-action starts. Now you can get to know everything, you always wondered about. Send your questions to Andrea. She'll pick the best ones and answer them in her video-blog. 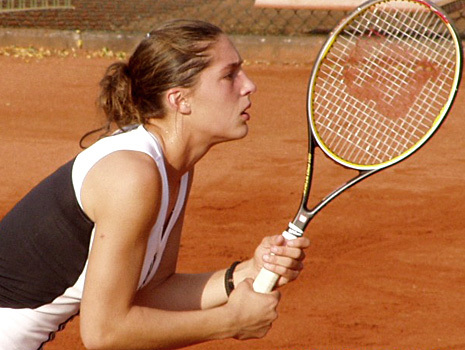 In the first round of the US Open Andrea Petkovic competes against Angelique Kerber. The number 106 in the world has made it through the qualification. The match will take place on monday, 31st of august. Keep your fingers crossed! There'll be a live-score and video-live-stream here: www.usopen.org.